Continuing a tear through the West Coast on their first visit to that region in two decades, the Phantom Regiment scored 80.85 last night in Riverside, over the Santa Clara Vanguard (80.45) and Division I newcomers the Mandarins (71.10) and Pacific Crest (69.90) on a beautiful evening that saw all corps turning in great performances, according to members and staffers of all attending corps. View a full score recap from Riverside Allison Scallan, the Regiment's trumpet section leader, said, "We had a great performance; we had a lot of energy coming out to the field and personally had a wonderful show. We put a lot of changes in the show and I nailed every one of them, and I also had some really good chops all through the whole show." 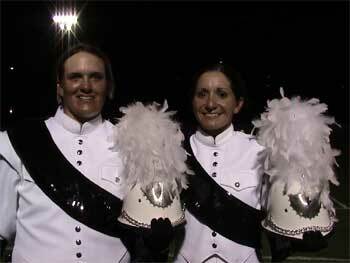 Allison Scallan (right) and fellow Phantom Regiment member Liz Wielenberg. Scallan, 22, of Pensacola, Fla., is the Regiment's trumpet section leader and horn sergeant. It's her fifth year in the corps. Scallan attributes the Regiment's 2003 success to preparation and hard work. "I think the success comes from our preparation and from just really working our butts off. I also think we found a formula that really works, and every year it gets better and better, so we are just adding a little more every year. Also the membership is just great, everyone is excited, everyone is working really hard, which I think is helping pay off." Leaders of the Santa Clara Vanguard were likewise pleased with their performance in Riverside. Drum major Stuart Shulman said, "I though the performance was great, probably the best one of the year, there was just lots of energy! Lots of things that we have been working out in rehearsal really came out strong. Of course there are some mistakes, some stuff that is just not there yet, but it is still early July and the energy and the passion coming through is what really matters right now." Shulman, 19, is in his third year in the corps and in his second year as drum major. Read a full interview with Shulman. Amy Inouye of the Mandarins said her corps turned in a great performance as well. "I though the performance was great! This is my last Riverside show and I was really looking forward to it. Also my personal performance was very good, I've reach that emotional level that I've been wanted to reach this past year." Inouye, 21, is from Sacramento, Calif., and is in her fifth year as a member of the Mandarins' color guard. "Tonight was our strongest performance of the season," said Pacific Crest director Stuart Pompel (also one of the corps' founders). "Our biggest issue right now is cleaning the show we have. It's a show that has been designed to do really well all the way through season, so what that means now is we have a long time remaining to now clean it." Pompel noted that the Pacific Crest would be adjusting its show in the coming weeks. "We are making significant change in the last third of our middle tune. We are actually changing the last part of it," Pompel said. In Division II action, San Diego's Esperanza came out on top, scoring 77.95, over Costa Mesa, California's Impulse (63.05). Gary Backlund, Esperanza's program coordinator, said, "I though it was a good run tonight. We just put in the last two minutes of our show, so tonight was our first complete performance, and I though that locked reasonably well. So the best part of tonight's show was simply to see the ending for the first time in uniforms." Michael Nash, Impulse's corps manager, said his corps performed successfully in Riverside as well. "Tonight's performance was a good performance, the first time of the year we finished the show!" Alliance from San Diego, a Division III corps, earned first place in that bracket with a 56.25. Patrick Chamberlain, 18, of Fallbrook, Calif. (Alliance's drum major), said, "I know we still have a few problems, but it was really good ... one of our better show of the year so far."